Bahiraii, S., Ahangari, G., Mirshafiey, A., Razazian, M., Mohammadi, F. (2017). Assessment of Changes in Expression of the 5-HT2A and GABAA Receptor Genes in Peripheral Blood Mononuclear Cells of Gas Station Workers, Tehran, Iran. Journal of Applied Biotechnology Reports, 4(3), 639-643. Sheyda Bahiraii; Ghasem Ahangari; Abbas Mirshafiey; Mehdi Razazian; Farkhondeh Mohammadi. "Assessment of Changes in Expression of the 5-HT2A and GABAA Receptor Genes in Peripheral Blood Mononuclear Cells of Gas Station Workers, Tehran, Iran". 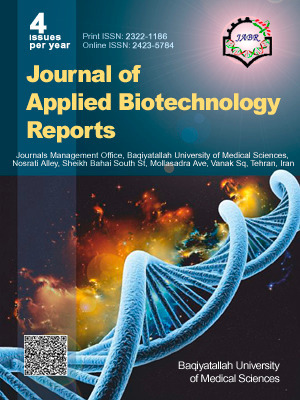 Journal of Applied Biotechnology Reports, 4, 3, 2017, 639-643. Bahiraii, S., Ahangari, G., Mirshafiey, A., Razazian, M., Mohammadi, F. (2017). 'Assessment of Changes in Expression of the 5-HT2A and GABAA Receptor Genes in Peripheral Blood Mononuclear Cells of Gas Station Workers, Tehran, Iran', Journal of Applied Biotechnology Reports, 4(3), pp. 639-643. Bahiraii, S., Ahangari, G., Mirshafiey, A., Razazian, M., Mohammadi, F. Assessment of Changes in Expression of the 5-HT2A and GABAA Receptor Genes in Peripheral Blood Mononuclear Cells of Gas Station Workers, Tehran, Iran. Journal of Applied Biotechnology Reports, 2017; 4(3): 639-643. Gasoline containing different chemical compounds especially aromatic compounds such as benzene, xylene, toluene and ethylbenzene which are the most dangerous compounds. Gas station workers have the highest potential for exposure to gasoline evaporation. Many studies have investigated the effect of gasoline vapors and cause of death in people working in gas stations. According to reports, the cause of death of these people is mainly due to cardiovascular disease, lung cancer, leukemia and other cancers in the world. With regard to the harmful effects of gasoline vapors on health and the importance of the relationship between the immune system and nervous, in this study we investigated alternations in gene expression pattern of the serotonin 5-Hydroxytryptamine 2A (5-HT2A) receptor and type A gammaaminobutyric acid (GABAA) receptor in peripheral blood mononuclear cells (PBMCs) of people working in gas stations, Tehran. For this purpose, The PBMCs were separated from whole blood of 30 gas station workers and 30 normal by Ficoll-hypaque. The total RNA was extracted and the cDNA was synthesized. This process was followed by Real-time PCR using specific primers for 5-HT2A and GABAA receptor mRNAs. Results have shown a significant increase (P = 0.001) in relative gene expression of 5-HT2A receptor whereas relative expression of GABAA receptor was significantly decreased (P = 0.004) in PBMC compared with normal control peoples. According to the role of the serotonin in asthma and due to the importance of the activity of this neurotransmitter through 5HT2A receptor which has a significant increase in patients with allergic asthma it can be concluded that workers in the gas station may be more susceptible to developing allergic asthma. On the other hand, low expression of GABAA receptor is associated with mental health problems such as depression, so it can also be concluded that people working at the gas station are more exposed to these health problems in comparison to normal people.